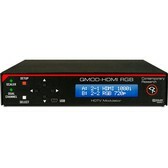 The Contemporary Research QMOD-HDMI RGB is an HDTV Modulator with 1 HDMI input and 1 RGBHV input. 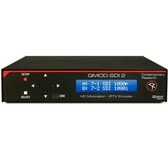 Connecting unencrypted HDMI digital signage or PC sources is now easier than ever. 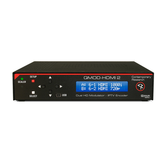 Distribute a high definition 720P or 1080i MPEG-2 stream over your existing coax cabling, stream your IPTV from the Gigabit port, and deliver a fully agile QAM signal on channels 2 through 135. 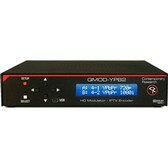 That means you can have up to 270 HD programs over 2 systems. Full scaling is now included which allows precise formatting of digital signage and accepts 1080p video, as well as compensates for 60/30 Hz consumer source and scales all video to a set resolution. Control via IP Telnet commands, front panel, web browser, IPTV, and IP control. The new generation of QMOD's feature dual channels and full scaling for both channels, these features make installation easy at an affordable price. Embeds captioning from Line 21 data on composite video inputs.